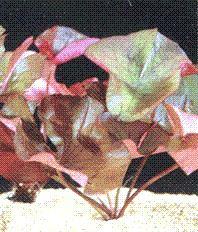 Andreana Reddish-orange, cup-shaped blooms that fade to rusty orange; leaves are green with dark, reddish-brown patches. Aurora Begins as a creamy yellow that gradually darkens to a deep red by the fourth day. A charming miniature. Comanche Most vibrant of the group, delicate pale yellow blossoms that slowly change to a rich copper. Indiana Cup shaped flower changes from apricot-orange to deep red-orange. Leaves are green with brown specks. Paul Hariot A shade tolerant lily with prolific, star shaped blooms that change from yellow to peach and stand high above lightly spotted pads. Sioux Largest of the group; blooms profusely. A rich yellow upon opening, maturing to a deep coppery shade of apricot-red. Arc-en-Ciel Soft, barely-pink flowers over true variegated foliage with splashes of red, pink, yellow & white. Fabiola Bright pink peony shaped flowers held over dark green leaves. A profuse bloomer. Firecrest Lovely lily with rounded pink petals & a bright yellow-orange stamen. Hollandia (Darwin) This large lily is a double with pink blossoms and very large bright green leaves. A fast growing, profuse bloomer. Lily Pons Pretty double pink blossoms with over 100 petals each. 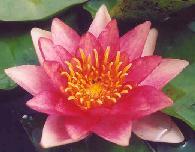 Dark pink outer petals with light pink inner petals. Madam Wilfron Gonnerre Striking light pink petals with a darker rose interior and a tendency to produce double flowers. Mayla Extremely large double fuchsia blossoms. 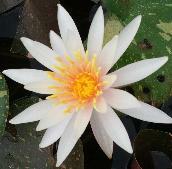 A very beautiful, profuse bloomer suitable for large ponds. Pink Fire Opal Produces fragrant, delicate coral-pink blossoms. 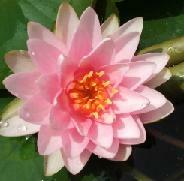 Excellent choice for smaller ponds & water features. Rene Gerard Attractive dark red center petals and lighter rosy pink outer petals contrast nicely against the deep green foliage. Rose Arey This lily boasts brilliant pink, very fragrant star-shaped blossoms. 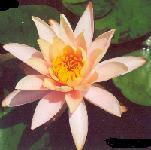 A profuse bloomers suitable for any size pond. Shady Lady A medium sized pink lily with cup-shaped flowers. 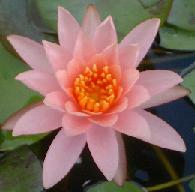 A pink lily that features mottled leaves. Sunny Pink Large, star shaped, peachy-pink blooms that loom over heavily mottled pads. A prolific bloomer with slight scent. 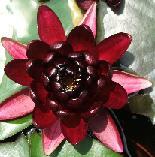 Almost Black Peony-shaped blooms, black and cherry-soda red in color, with dark green foliage. Attraction Outstanding garnet with pale-pink sepals & deep yellow stamens. 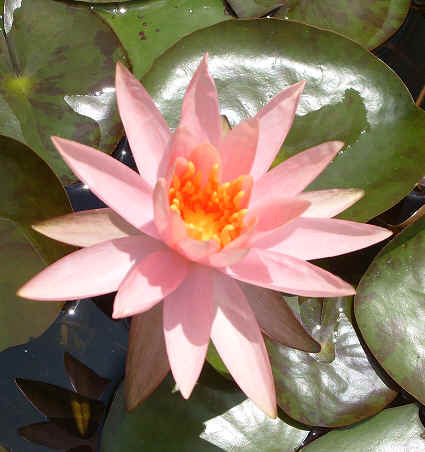 This large lily is considered a requirement for any water feature. Baby Red Petite blooms that are deep red and cup or ball-shaped. Foliage is medium to dark green. Black Princess This truly magnificent lily boasts deep reddish-black blooms held regally high over dark burgundy foliage. Burgundy Princess Goblet or peony-shaped blooms that are bright red in color; dark green foliage. Charles de Meurville A slightly fragrant lily with rich, wine-red outer petals and pink inner petals that are stunning against the large, dark green pads. 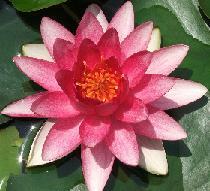 Conqueror 7 to 8" flower with deep red inner petals and white outer petals that become pink; slightly fragrant. Gloriosa Cup shaped, candy apple red blooms of about 6" over bronze-green foliage. Laydekeri Fulgens This is a free-flowering, early bloomer. The blooms are cup-shaped, burgundy-red with long stems. Pygmy Rubra Initial blooms are pink, then deepen to warm red. 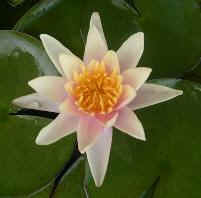 Perfect for small ponds and tub gardens. Red Glow Medium sized, flaming pink to red, star shaped blooms. A moderately strong bloomer with a subtle scent. Red Spider This attractive lily boasts star shaped, pointed red blossoms & crinkled petals held high above the mottled foliage. 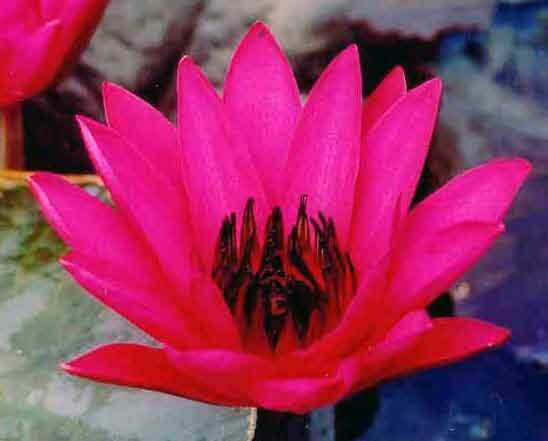 Rembrandt Our most popular red lily, suitable for any size water garden. Deep crimson, long-lasting semi-double flowers. Sultan Fares well in hotter climates. 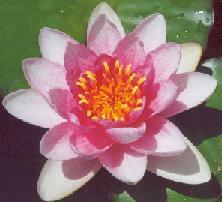 Inner petals open deep pink, outer petals open pale pink; all petals turn deep red by 2nd day. Barbara Dobbins Goblet-shaped blooms that turn from pale yellow to peach with deeper pink blush; beautiful mottled leaves. Colorado Peach Large orange-peach colored blossoms & brightly hued foliage makes this lily a "Must Have"! Georgia Peach Extremely large apricot flowers above lightly speckled foliage. Peace Lily Unique blend of peach and apricot hues in this profuse bloomer that has green leaves with reddish-brown flecked undersides. Peaches & Cream Deep pink with peach and yellow peony-shaped blooms; young leaves are purple-speckled, aging to green. 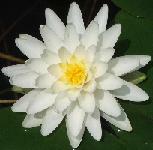 Albatross Dazzlingly bright white petals over dark green foliage make this lily very desirable in any water feature. Caroliniana Nivae Snow-white blooms that contrast beautifully with deep-green foliage. Dagan's Delight Large star shaped blooms that stand tall above heavily mottled pads. A prolific bloomer that is slightly scented. Denver Creamy-white double-blooms with a hint of yellow. 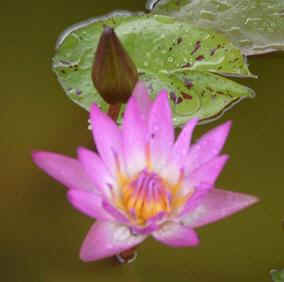 Free-flowering lily with blooms that remain open later in the day. 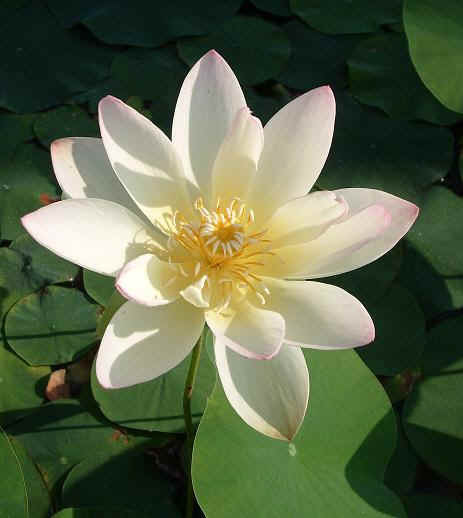 Double White Off-white lily with 4" to 6" peony-shaped double-blooms and lovely green leaves. Gonnere "Snowball" Fullest of all double-bloomers. Lightly-scented white blooms resemble snowballs. Performs best in cooler climates. Odorata A very fragrant, popular lily with creamy white blossoms and bright green foliage. Postlingberg Large, star shaped, pleasantly scented blooms. A moderately strong bloomer. Virginalis The 'Queen of the Whites'! Semi-double, virgin-white flowers that float beautifully above rich purple-flushed green foliage. Profuse. White Sultan Large, goblet shaped blooms, egg-shell in color contrasted against new pads that are dark red. A moderately strong bloomer. Charlene Strawn Free blooming lemon-yellow blossoms surrounded by green & burgundy variegated foliage. Reliable & easy! Chromatella Dark yellow centers with lighter yellow, sharply defined petals held above marbled leaves. Helvola True hardy; does well in cooler climates. Slightly fragrant, yellow blooms that open and close later in the day than most. 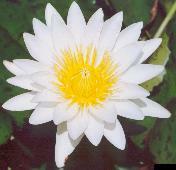 Inner Light Large, free-flowering lily with deep green leaves and yellow blooms with cream-colored centers. Joey Tomocik Vibrant lemon-yellow blossoms above softly mottled foliage. 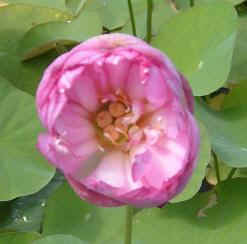 Profuse bloomer with a long flowering season. Lemon Mist Hard to find, double-flowering lily with delicate, lemon-yellow blooms. Very versatile, it adapts to any size pond. Sulphurea Bright yellow blossoms with decorative orange stamen. 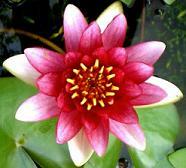 Suitable for smaller ponds or water features. Free flowering. Texas Dawn Bright yellow blossoms are held regally above richly mottled foliage. Profuse bloomer. 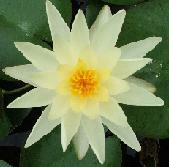 Yellow Queen Medium sized, star shaped, pale yellow blooms with tapered petals against mottled foliage. Moderate bloomer with a slight scent. Albert Greenberg Unique lily with 8" cup shaped blooms that are a mix of pink, yellow & orange and with mottled green leaves. Green Smoke Chartreuse with smoky blue tips. Platter-shaped blooms of 6-8". Lightly speckled, bronze-green leaves. August Koch Medium blue color. 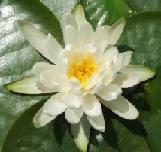 Platter shaped, fragrant blooms of 8-10'. Green leaves. Blue Beauty Lilac blue. Cup-shaped blooms of 8-10" with a spicy perfume. Dark green leaves speckled with brown. Blue Capensis Blue to pale blue, platter-shaped blooms of 6-10". Mottled leaves. Colorata Pinwheel-shaped blooms of 3-4" that range in color from purple to blue to violet. Green leaves. Dauben Creamy white with lavender tips. Star-shaped, fragrant blooms of 2-4". Green leaves. Capensis Pink platter-shaped blooms of 6-10". Mottled leaves. Queen of Siam Pink with green in the outer petals. Double, star shaped blooms of 6-8". Highly mottled leaves. Shirley Bryne Deep pink with yellow centers. Cup-shaped blooms of 4-6". A strong bloomer. Green leaves. Sturtevantii (Nightbloomer) Strong pink-edged blooms with pale centers. Heavily scented, star shaped blooms of 6-10". Bronze leaves. Director Moore Intense violet-blue with gold centers. Cup-shaped blooms of 8". Dark green leaves mottled with purple. Hilary Pale lavender. Cup or star shaped blooms of 4-6". Green leaves. King of Siam Stunningly large, full, deep-blue, flat blooms with green leaves that have violet undersides. Madame Ganna Walska Dramatic lipstick-pink to lavender. Abundant platter-shaped blooms of 6". Heavily mottled leaves. Midnight Purple with gold centers. 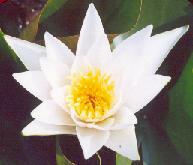 Free-flowering with star shaped, double, fragrant blooms of 6'. Dark green, red-flecked leaves. Panama Pacific Deep plum with yellow stamens. Platter-shaped blooms of 6-12". Bronze-green leaves with reddish spots. Tina Blue and pink with yellow centers. Star-shaped blooms of 4-6". Green leaves. Antares (Nightbloomer) Intense crimson. Cup-shaped blooms of 5-6". Bronze leaves. Red Cup (Nightbloomer) Strong red-rose. Star-shaped blooms of 4-6". Red leaves. Red Flare (Nightbloomer) Deep red. Star-shaped blooms of 6-10". Maroon leaves. A strong performer. Marian Strawn Snow-white and slightly gray. Stellate blooms of 6". Slightly mottled leaves. Missouri White (Nightbloomer) Creamy white. 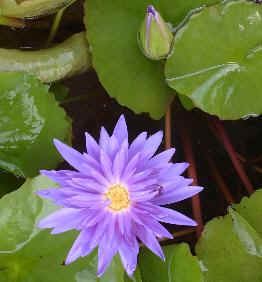 Star-shaped blooms of 12' with broad petals. Green leaves with copper-brown new growth. Stellata White (Nightbloomer) White. 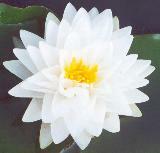 Platter-shaped blooms of 6+". Heart shaped green foliage. Trudy Slocum (Nightbloomer) Showy lily with snow-white, platter-shaped blooms of 4-8" and lovely solid green leaves. 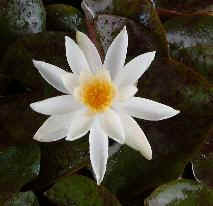 White Capensis Large white, star shaped blossoms that sit high above large, deep-green leaves. This lily is a profuse bloomer. 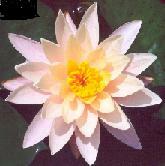 Crystal Beauty - Bing Jiao Medium size lotus with a cream colored double flower. 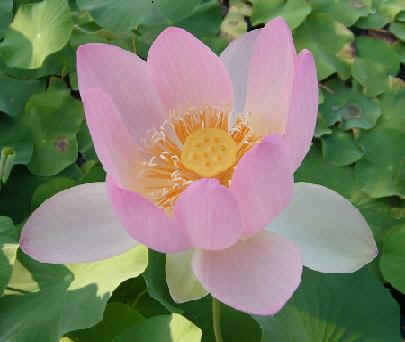 Empress - Alba Striata Medium size lotus with spectacular white blooms trimmed in dark pink. Evening Shower Soft pink flowers 4-6 in across with large green leaves. Green Maiden Full blooms that change from pink to yellow to cream. Green foliage. 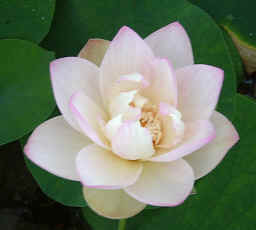 Lu Shan White (Lu Shan Bai Lian) Large lotus boasts an exquisite light pink double flower with darker pink edging. 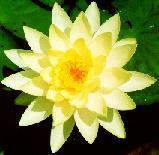 Lutea (American Lotus, Yellow Bird) Native yellow with large yellow flowers and lighter yellow tips. Momo Botan Stunning double rose/pink blossoms. 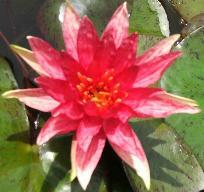 This dwarf variety lends itself well to smaller ponds. Mrs. Perry Slocum This exquisite changeable begins pink, then pink & yellow, finishing a creamy peach..
Peach w/ Raindrops (Tao Hong Su Yu) Dwarf lotus with stunning rose colored double flower. 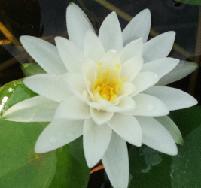 Pond Oriole (Chu Shui Huang Li) Yellowish-cream flower with a semi-double bloom. 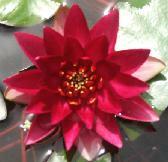 Red River (Man Jiang Hong) Striking lotus with large red, cup shaped double blooms. 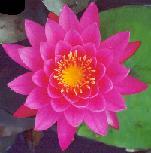 Red Scarf (Hong Lin Jin) Showy lotus with a large red flower held high above the light green foliage. Small Green Tower (Xiao Bi Tai) Also known as Little Green House. Dwarf with a white double flower. 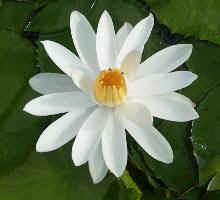 Snow White A medium size lotus with full, pure white double blooms and deep green leaves. 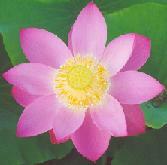 BOOK: The Lotus: Know It and Grow It 448 pages. By Kelly Billing and Paula Bales. Background, Cultivation, Uses, Troubleshooting. Banana Plant (Nymphoides aquatica) Looks like a small bunch of green bananas. Round reddish-green leaves. Mosaic Plant (Ludwigia sedioides) LDiamond shaped red and green floating leaves with tiny yellow flowers and creeping stems. Snowflake, Variegated White (Nymphoides cristata) Dainty white flowers are stunning against variegated burgundy, heart-shaped leaves. Snowflake, Variegated Yellow Fringe (Nymphoides geminata) Reddish-brown and green ovate leaves with tiny yellow blossoms. Snowflake, White Fringe (Nymphoides indica) White snowflake shaped flowers with round, lily-like leaves. Snowflake, Yellow - Floating heart (Nymphoides peltata) Long-stalked, heart-shaped leaves with petite yellow flowers that bloom above the water. 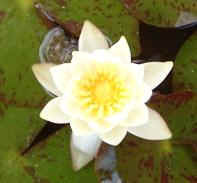 Spatterdock, Cape Fear (Nuphar japonica) Japanese Pond Lily'. Light green leaves w/ transparent sections. Ht. 10-30" Medium to full sun. 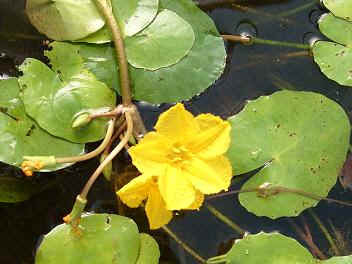 Spatterdock, Yellow Pond Lily (Nuphar lutea) Also called 'Cow lily'. Wavy leaves up to 16" across. Medium to full sun. Tiger Lotus - Red/Green (Nymphaea zenkeri) Plants grow from round bulbs rather tubers. Tiger striped leaves with stately surface blooms. Water Poppy (Hydrocleys nymphoides) Pale yellow flowers with reddish-brown centers over thick, shiny, dark green heart-shaped leaves.